The Kings will face Chicago or Detroit when they attempt to reach the Stanley Cup finals for the third time. Justin Williams figures he gets his knack for Game 7 heroics from the same source as the Los Angeles Kings' resilience throughout their grinding seven-game victory over the San Jose Sharks. Williams thinks the Kings all drew their inspiration from that Stanley Cup championship banner hanging over the Staples Center ice, and it carried them through to the Western Conference finals. "It comes from the hunger of winning one and having that drive for another one," Williams said. "You don't want anyone else to raise the Cup but you." Williams scored two goals in the second period, and the Kings advanced with a 2-1 victory over San Jose on Tuesday night. Jonathan Quick made 25 saves as the defending champs finished off this agonizingly even series with their 14th consecutive home victory over the past two months, including seven straight in the postseason. Not much separated the teams in this thrilling all-California series, but the Kings cited last season's trophy for their poise and persistence in another nail-biting clincher. "I certainly enjoy pressure situations," said Williams, whose goals were 2:57 apart. "I know everyone in this dressing room does. We pride ourselves on being a team that, push comes to shove, we're going to get it done. We've been through it before, and we know we can do it." Williams scored on a power-play tap-in and a one-timer, putting the Kings on top to stay. The veteran wing came in with an eight-game, goal-scoring drought, but the two-time Stanley Cup winner has scored nine points in his four career appearances in a Game 7. The Kings will face Chicago or Detroit when they attempt to reach the Stanley Cup finals for the third time. 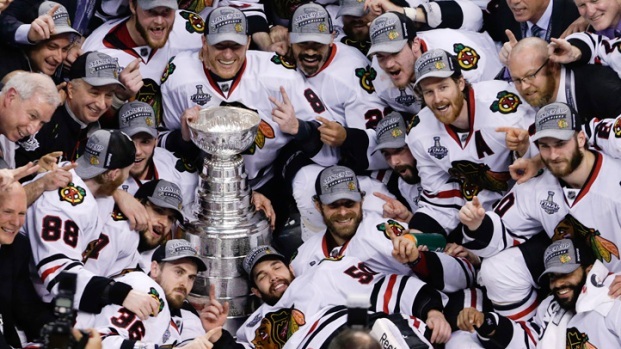 The Blackhawks will host the Red Wings in Game 7 on Wednesday night. The home team won all seven games in the series, as did the team that scored first. The fifth-seeded Kings barely rode their home-ice advantage to victory in their first potential elimination game in the last two years. "They were as good as us," Los Angeles coach Darryl Sutter said. "We just scored." Quick and his teammates barely held off the Sharks in a frantic third period. Quick showed off his Conn Smythe Trophy form yet again, finishing the seven-game series by allowing just 10 goals. "We're going to play every game like this, no matter what," Quick said. "It doesn't matter how many games it takes, especially against that team. We're fortunate to move forward." Antti Niemi stopped 16 shots, and Dan Boyle scored early in the third period for the Sharks, who fell just short of their third trip to the conference finals in four years. Even during a year of roster turnover and change, sixth-seeded San Jose remained a serious contender in its ninth straight playoff appearance. "We thought we could come in here and steal a game," Sharks captain Joe Thornton said. "We played our hearts out, and that's all you can ask of each other. We had to lay it on the line in the third, and I thought we did. Jonathan Quick is just a fantastic goalie. ... We were just having so much fun. It's disappointing that it has to end, because we were really enjoying this. It's a tough way to finish." Los Angeles has won eight straight home playoff games, dating to last season's Stanley Cup clincher, but this one might have been the toughest. San Jose pressed the action throughout the third period after Williams' back-to-back goals put the Sharks in a mid-game hole, but Quick and the Kings' defense hung on for a win in Los Angeles' first Game 7 at home since 1989. "The way they banded together and the way they played for each other was exceptional," San Jose coach Todd McLellan said. "It's a great sign for our organization. I think we have something to build on moving forward." After a scoreless first period in Game 7, featuring plenty of near-miss chances but just eight combined shots, the Sharks again came out solidly in the second. San Jose held the Kings without a shot for nearly 19 consecutive minutes. But the Kings finally broke through after San Jose's Brent Burns took an interference penalty near Los Angeles' net. Williams got the puck to the post and hacked at it until it slid behind Niemi for his first goal since Game 4 of the first round. Williams has been candid about his line's offensive struggles during this postseason, saying the Kings' top scorers had to get better for Los Angeles to advance. He did it again 2:57 later, taking a cross-ice pass from Anze Kopitar and beating Niemi from short range with a one-timer. Williams had just two assists in the Kings' previous eight playoff games. Niemi kept the Sharks in it with two stunning saves, preventing a natural hat trick by Williams several minutes before stopping Brad Richardson's one-timer. But Quick matched every save, and the Kings preserved their two-goal lead into the third. Niemi made another enormous save during 4-on-4 play early in the third, stopping Jeff Carter on a breakaway. Boyle ended Quick's bid for his third shutout of the series with a long shot through traffic with 14:34 to play, giving the defenseman his third goal of the postseason. Quick kept making astonishing saves until the final seconds, robbing Joe Pavelski on an open chance with his glove extended along the ice with 5:04 to play. "We probably made one more mistake than they did, and we couldn't find a way to get another puck by Quick," McLellan said. "We would love to go back and play Game 2 over again, the last four or five minutes. That's probably one that we needed and didn't get." This series was even from the start, with neither team able to take more than momentary control. The clubs were similarly equal in the regular season, when the Kings' 3-2 home victory over San Jose in the finale pushed fifth-seeded Los Angeles ahead of the Sharks. That eventually led to the Kings starting a playoff series at home for the first time since 1992, but the uncanny home-ice advantage held: The home team has won 16 of these Pacific Division rivals' 17 meetings in the past two seasons. Los Angeles opened the series with two home victories, stealing Game 2 with a pair of power-play goals in the final minutes for the only major comeback of the series. 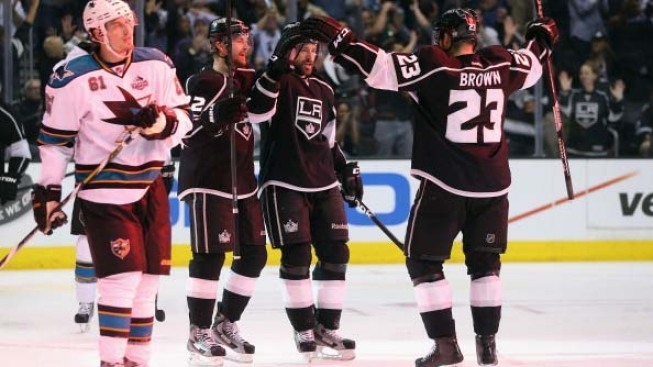 The Sharks responded with two solid 2-1 victories at home, keeping the Kings' offense punchless away from Staples Center. Quick posted his second shutout of the series in Game 5, but San Jose forced a seventh game with another 2-1 victory at the Shark Tank last Sunday.